Experience Shanghai Disneyland as a VIP and live the Disney Day of Your Dreams! Disney Premier Tours: 6 consecutive hours with a minimum of three (3) guests and a maximum of eight (8) guests. Hassle-Free Planning – Come up with your dream day in the park and let your concierge be your guide – designing a customized tour based on the specific needs of your family and friends. Quick Admission – Start your magical journey at the park’s VIP entrance. Exclusive Attraction Access – Enjoy expedited access to Shanghai Disneyland attractions and shows. Reserved Entertainment Viewing – Enjoy special reserved seating in designated viewing areas for daytime performances and the park’s Nighttime Spectacular. Merchandise Discounts – Shop with your tour guide and enjoy discounts on select merchandise across Shanghai Disney Resort. Concierge Services – Explore the magic and hear about some of the park’s secrets from your tour guide. Each tour is 6 consecutive hours with a minimum of three (3) guests and a maximum of eight (8) guests. *Children over 1 meter are considered guests. Additional hours or additional guests will incur a surcharge, please contact the Disney Premier Tour Services reservation center at +86 (21) 2060-3366 for more information. Payment must be made in full before the start of the tour. Should your plans change, we require forty-eight (48) hours advance notice or you will be charged a cancellation fee equivalent to the full cost of your booked tour. The price of Disney Premier Tours varies by date. Guests can check the price in advance and make a reservation on the Shanghai Disney Resort Official WeChat account (scan the QR code below to access the Wechat account). All offers, events, tickets, age ranges, services, attractions and entertainment options may be seasonal and are subject to change at any time. Reserved viewing for select daytime shows and parades is based on availability and is weather permitting. At least one (1) guest in your party must be aged 16 years or older. Park admission is not included with the cost of the tour. 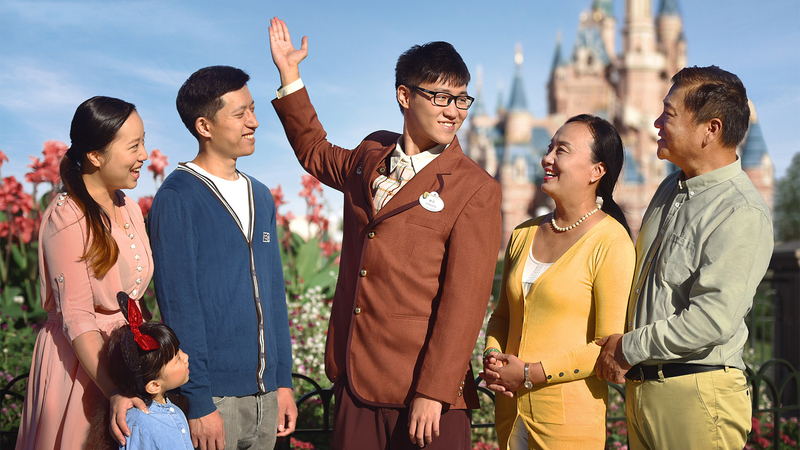 When you arrive at Shanghai Disney Resort, please meet your tour guide at the pre-determined meeting location. Present your tour guide with your confirmation letter and/or confirmation number along with the credentials (Government ID, Travel Document, or Passport) used to book your tour. Ensure your entire party is present at the start of your tour to enjoy the full experience and all the benefits. Tours are Non-transferable and Non-refundable (unless otherwise provided by law). Tours can be modified only twice and is subject to availability. Changes to the date of tour must occur 2 days before the entitlement date. We may from time to time, change the operating hours of the Park or any Park attraction, close the Park or any part of it temporarily, restrict the number of persons having access to the Park, and/or suspend or cancel any attraction or entertainment program. The tour must be used by the same group of people during its period of validity. In the instance of inclement weather, tours will still commence. We encourage our Guests to dress accordingly. We may photograph, film, videotape and/or record in the Park. Guests’ entry into the Park constitutes guests’ consent to be filmed, photographed and/or recorded, and to our use of these images and/or sound recordings, which may capture your portrait and/or voice, for our internal business, administrative and operational purposes or other directly related purposes, for the purposes of meeting the legal, safety or security requirements, or for other legitimate purposes. Guests are responsible for the security and protection of your personal belongings at all times. Admission to Shanghai Disneyland is subject to Park Rules and Regulations as posted on our website (https://www.shanghaidisneyresort.com/en/rules). These terms and conditions are subject to change. If there are mandatory requirements stated in the laws otherwise, then related ordinances will be followed. For the purposes of these terms and conditions, “we” means either or both of “Shanghai International Theme Park Company Limited” and “Shanghai International Theme Park and Resort Management Company Limited”. To learn more about Premier Tour Services, or to make a reservation, please contact the VIP Reservation Center on +86 (21)-2060-3366. Guests under the age of 18 must have a parent or guardian’s permission to call. Should you have any questions on the day of your tour, please contact Disney Premier Tours at +86 (21)-2099-9222 before the start of your tour. Guests should be 18 or older to make a reservation of Disney Premier Tours.